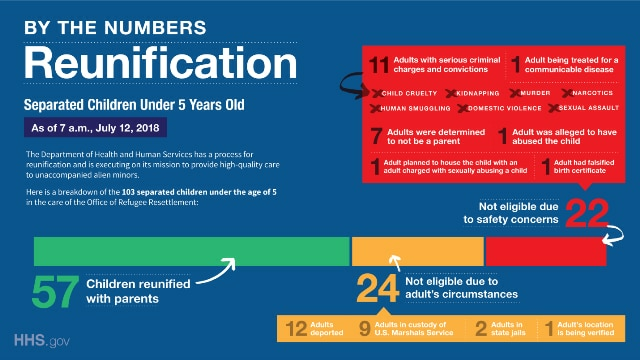 Under order of the U.S. District Court for the Southern District of California, the departments of Health and Human Services (HHS), Homeland Security (DHS), and Justice (DOJ) have been reunifying alien minors under 5 years old who are currently in the custody of HHS with adults who have been in the custody of DHS. “Dedicated teams at the Departments of Health and Human Services, Homeland Security, and Justice have worked tirelessly to ensure the safety of Ms. L class members. As of this morning, the initial reunifications were completed. Throughout the reunification process our goal has been the well-being of the children and returning them to a safe environment. Our agencies’ careful vetting procedures helped prevent the reunification of children with an alleged murderer, an adult convicted of child cruelty, and adults determined not to be the parent of the child. Of course, there remains a tremendous amount of hard work and similar obstacles facing our teams in reuniting the remaining families. The Trump administration does not approach this mission lightly, and we intend to continue our good faith efforts to reunify families. “Certain facts remain: The American people gave this administration a mandate to end the lawlessness at the border, and President Trump is keeping his promise to do exactly that. Our message has been clear all along: Do not risk your own life or the life of your child by attempting to enter the United States illegally. Apply lawfully and wait your turn. Below are more details on HHS, DHS, and DOJ progress on reunification, as of 7 a.m. EST, July 12, 2018. 57 children have been reunified as of 7 a.m. EST on July 12. 46 children were acknowledged by the court to be ineligible for reunification or determined by HHS, DHS, and DOJ to be ineligible under court-approved criteria. 11 adults have a serious criminal history (charges or convictions for child cruelty, kidnapping, murder, human smuggling, domestic violence, etc.). 7 adults were determined not to be a parent. 1 adult had a falsified birth certificate (parentage is being examined). 1 adult was alleged to have abused the child. 1 adult planned to house the child with an adult charged with sexually abusing a child. 1 adult is being treated for a communicable disease. 12 adults have been deported and are now being contacted. 9 adults are in custody of the U.S. Marshals Service for other offenses. 2 adults are in custody of state jails for other offenses. 1 adult’s location has been unknown for over a year.